(Washington Times) Hulgize Kassa, a 52-year-old from Raleigh, N.C., earned his spot at the front of the line. The father of two camped outside Walter E. Washington Convention Center starting at midnight Friday, watching as Ethiopians from as far as Colorado and Texas arrived with boxes of food, speakers and selfie sticks. By 7 a.m. Saturday, thousands had gathered in the streets spanning Mount Vernon Place to N Street, honking car horns and sharing food. Most wore T-shirts emblazoned with the face of their homeland’s newly minted prime minister, Abiy Ahmed. In the three months since his rise to power, the 41-year-old politician has introduced sweeping changes to Ethiopia, lifting a state of emergency, brokering peace with neighboring Eritrea and releasing hundreds of political prisoners. 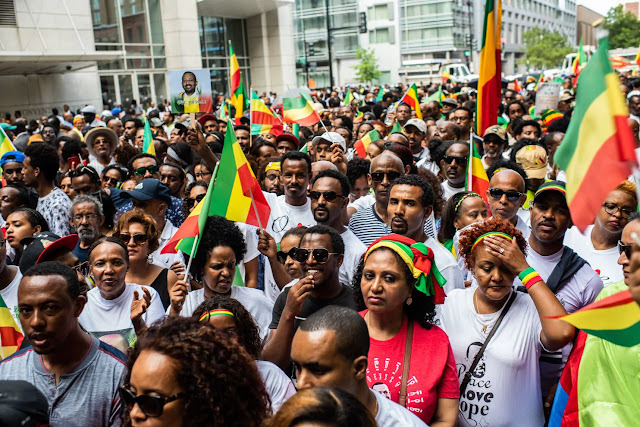 These dramatic steps toward liberalization have sparked “Abiy-mania” within the Ethiopian diaspora in the United States, which, for decades, stood among the fiercest critics of the ruling party’s autocratic regime. Abiy is in the United States to visit and speak to members of the diaspora. The Washington area is home to some 300,000 Ethiopians, making it the largest community outside the African country. “I want to hug him. He’s a hugger, I know, so I want to hug him,” said Kassa, a researcher at North Carolina State University. When Kassa first came to the United States in 2000, he never thought he would go back to his homeland. But Abiy’s ascension has changed his mind, he said. He plans to visit his home in the Amhara region next year, and bring his children, 12 and 14, with him. Abede Yimenu, a former major in the Ethiopian army, said he is also thinking of going home after having been away for 17 years. The 57-year-old from Dallas was in the District with three friends from his days in the Ethio­pian military, all clad in army uniforms, complete with black sunglasses. After fighting together in the Eritrean-Ethiopian War of 1998 to 2000, they left for the United States, unhappy with the oppression imposed by their government, Yimenu said. Inside the convention center, the crowd spent the hours before Abiy’s arrival dancing, waving Ethiopian and Eritrean flags, and engaging in ululation, called ililta. For many, this is the first time they are seeing so many Ethiopians in a single place, save for being in the country itself. About 2:45 p.m., Abiy walked onstage in a white, glossy suit with gold accents, and the room exploded in cheers. Nearly everyone stood on their chairs, and many stayed there until they were told to sit. Religious leaders began the rally with prayers, praising Abiy and celebrating the future of the country. D.C. Mayor Muriel E. Bowser also addressed the crowd, declaring July 28 “Ethiopia Day” to rapturous applause. Abiy spoke primarily about unity, telling the audience that “our ancestors were wrong about having division.” He called on members of the diaspora to invest in Ethiopia and to return home — a message that seemed especially resonant for older members of the audience. Saba Gizau, a 58-year-old grandmother from Maryland, said that after two decades away from Ethiopia, she is ready to go back. Gizau, who had been at the convention center since 4 a.m. with her 56-year-old sister, works in sales at a Nordstrom department store and said she wants to impart what she knows about business to Ethiopians back home. Labels: Dr. Abiy Ahmed, Ethiopia, Ethiopian Diaspora, News, Washington D.C.